Going through my cookbooks has revealed some great new recipes, including this one. 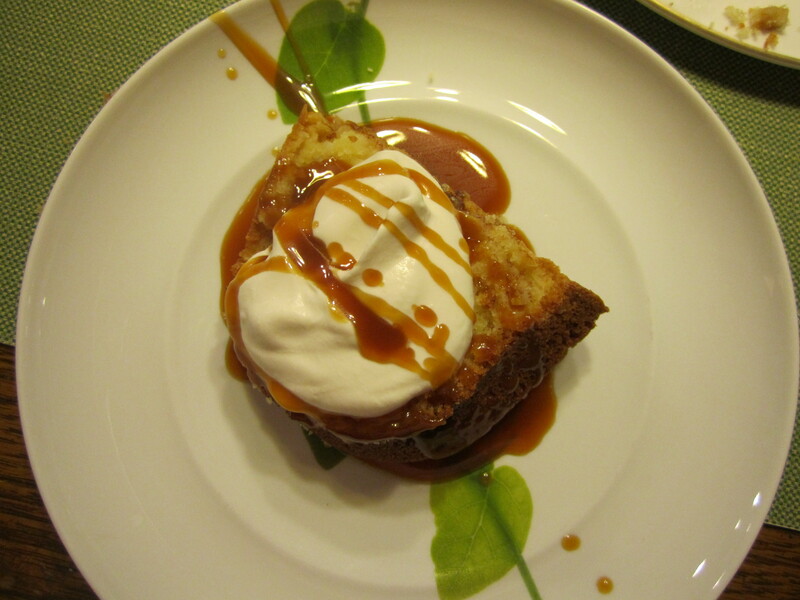 It includes a Carmel Sauce and Bourbon Whipped Cream which I served with the cake for my dinner guests, making it very elegant. 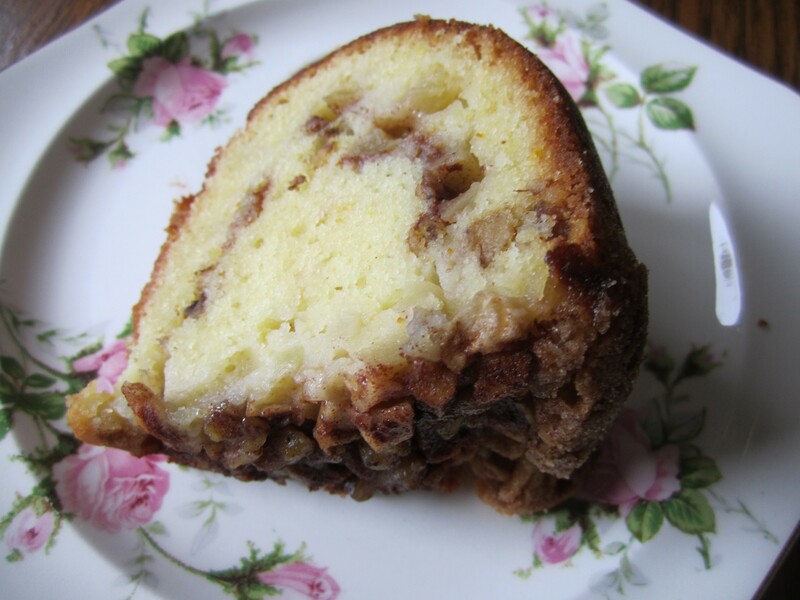 But it can also be served as is, more in line with a coffecake. I just gave my husband a slice this morning with a cup of cappuccino. Yum. I did not make the caramel sauce from the recipe because I actually had some that I forgot to serve at our Family Party! I don’t know whether I was being virtuous for using what I had or just plain lazy! 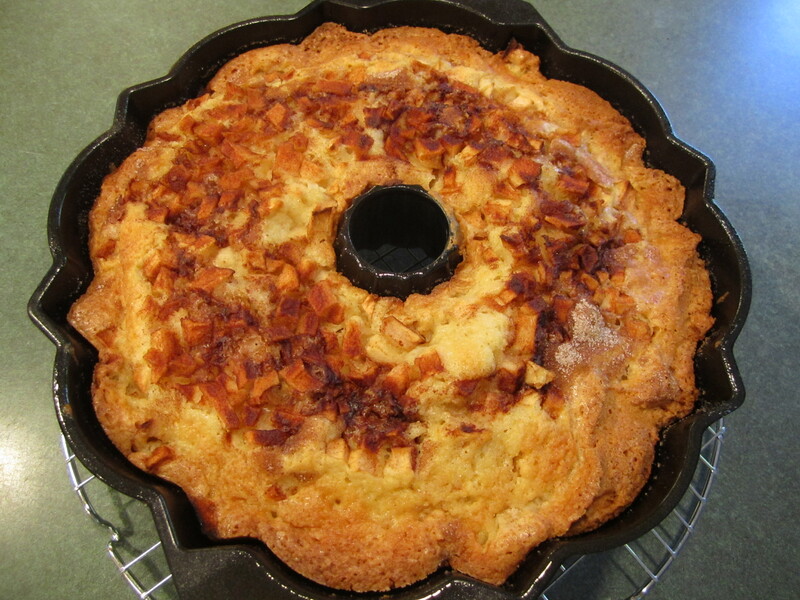 The one I had and used came from David Lebovitz, The Perfect Scoop: sugar, heavy cream, salt and vanilla. You may like the brown sugar version, I have made other recipes like this before, they are a bit easier than the traditional. I encourage you to try it! Preheat oven to 350 degrees. 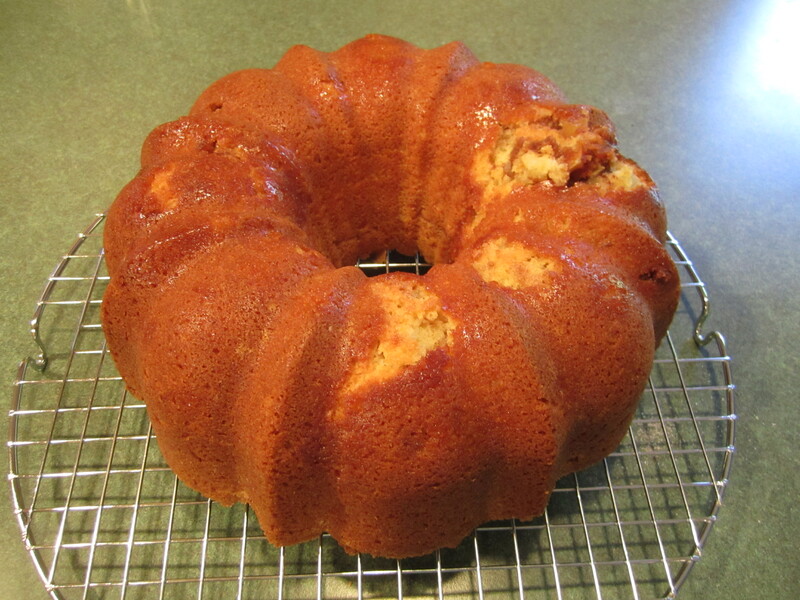 Butter a 12 cup nonstick Bundt pan. 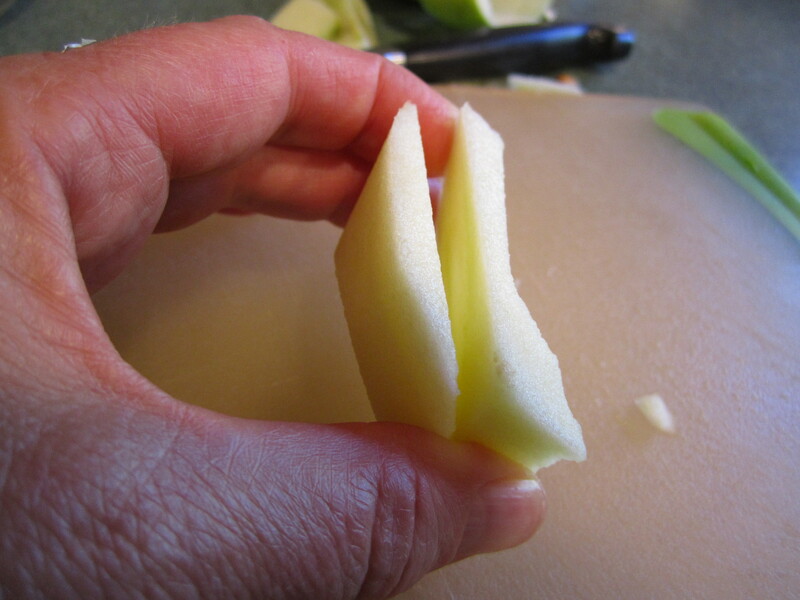 Dicing the apples: take one-quarter of the apple, and slice it in half lengthwise. Keeping the halves together, slice lengthwise into 4 sections. Then slice again horizontally to make perfect little 1/2 inch cubes. 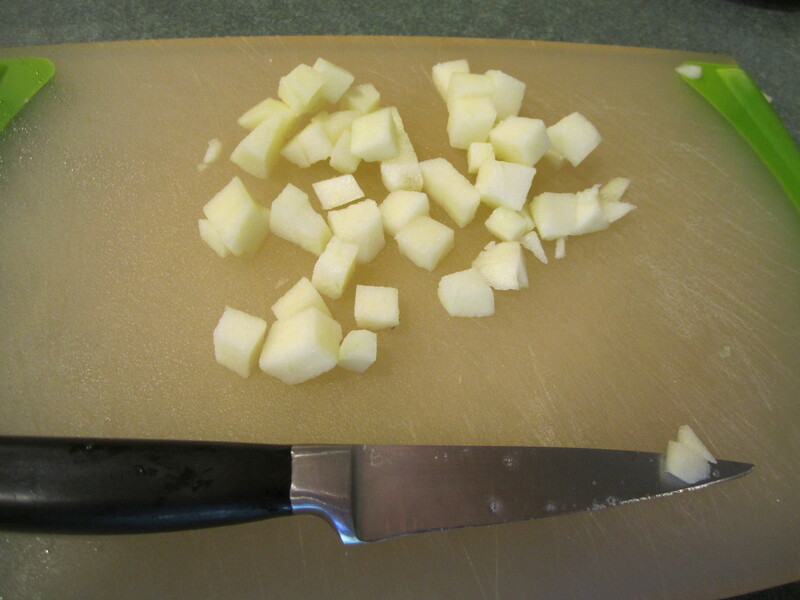 4 medium apples should yield 4 cups of diced apples. 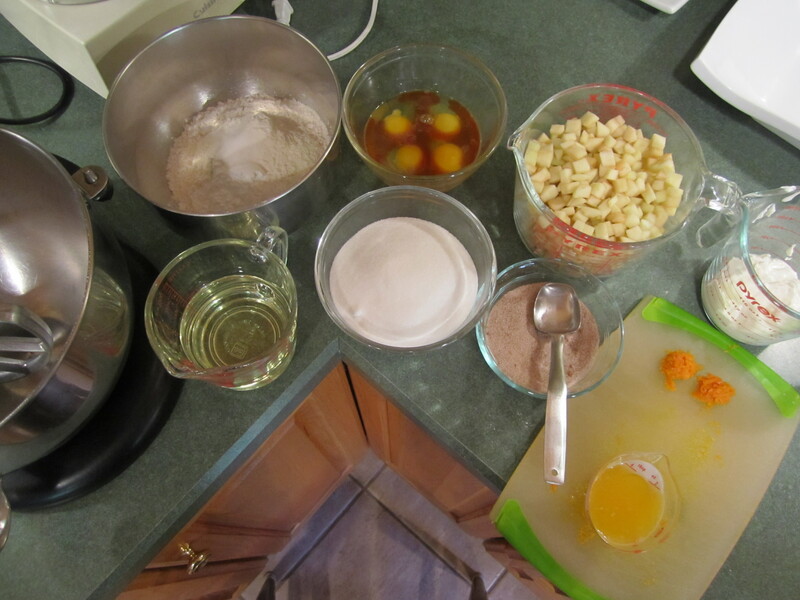 Mix 1/2 cup sugar and cinnamon in small bowl and set aside. 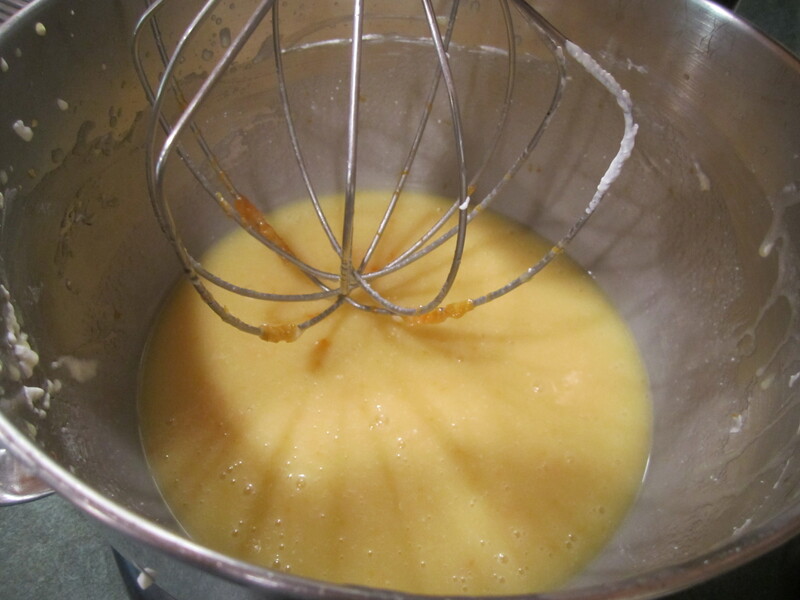 Mix flour, baking powder and salt in medium bowl and whisk together. Whisk 2 cups sugar, oil, sour cream, eggs, orange juice, orange zest and vanilla in a large bowl to blend (you can use the whisk attachment on your mixer as well). 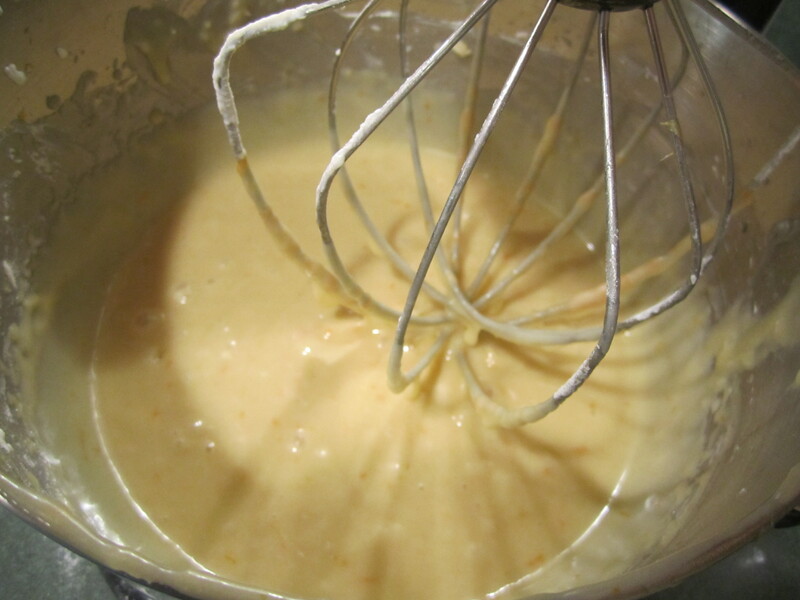 Stir in flour mixture and whisk together until completely blended. 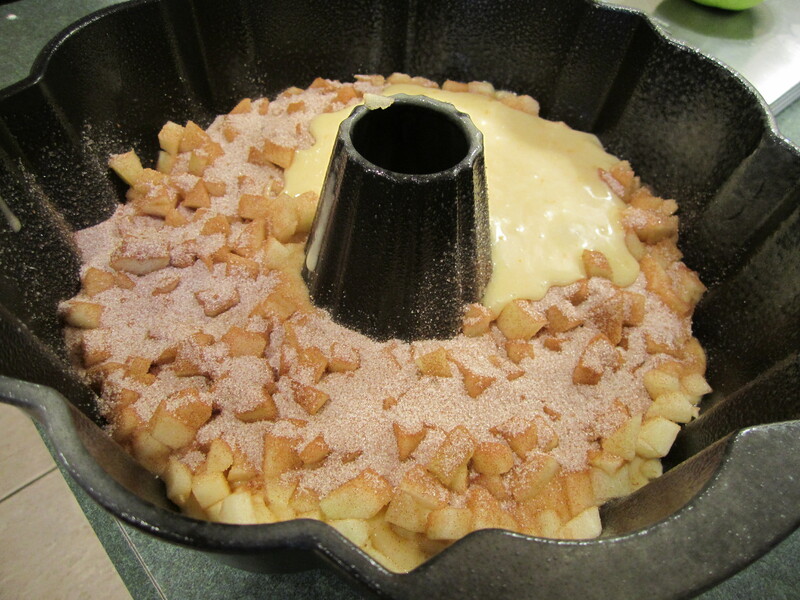 Pour half of batter into prepared bundt pan. 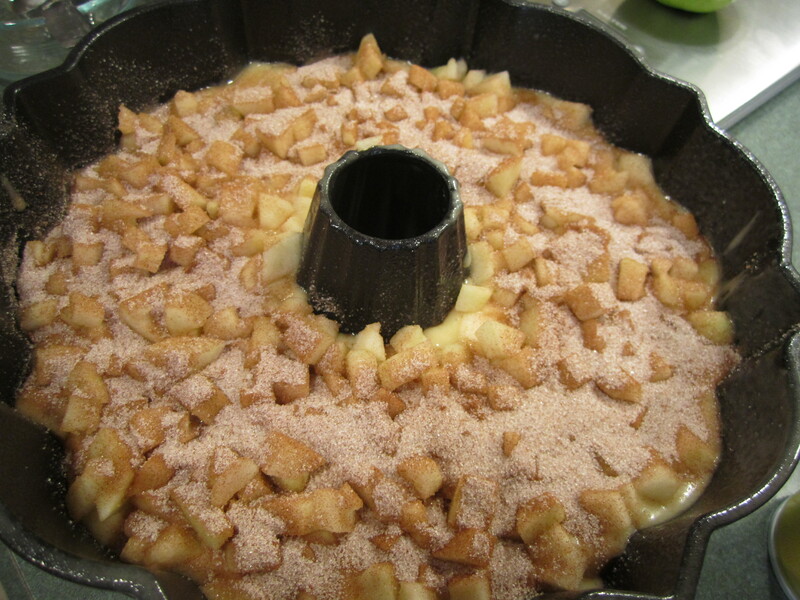 Sprinkle half of apples over batter, then half of chopped walnuts and half of cinnamon/sugar mixture. Spoon remaining batter over. Sprinkle remaining apples, walnuts and cinnamon/sugar mixture over. Right before serving, dust cake with sifted powdered sugar. 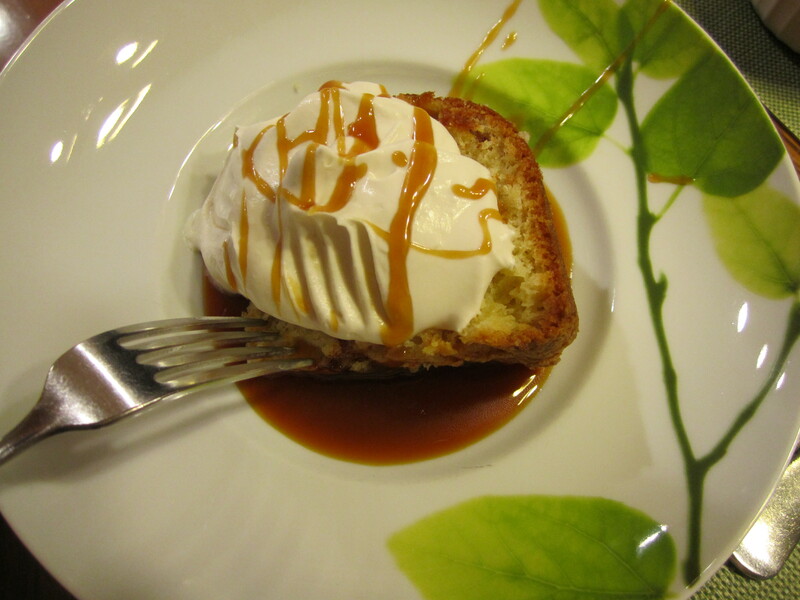 Serve with warm Caramel Sauce and Bourbon Whipped Cream. Beat cream and sugar in large bowl until soft peaks form. Add bourbon and beat until stiff peaks form. This is my very reduced version of the above because I felt it was way too much whipped cream. I also do not like to whip the heavy cream until stiff peaks. I enjoy it more when the whipped cream is soft. Beat cream and sugar in medium bowl until soft peaks form. Add bourbon and beat until just combined. You also can reduce or eliminate the bourbon, depending on your taste preferences.